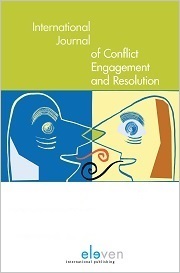 The International Journal of Conflict Engagement and Resolution (IJCER) is produced by the Graduate Program on Conflict Resolution, Management and Negotiation at Bar-Ilan University. It publishes articles from scholars, graduate students and practitioners that address conflicts, defined broadly to include: interpersonal, familial, inter- and intra-organizational/business, national and international conflicts. It endorses all disciplines with the aim to contribute to the empirical, theoretical, prescriptive or practical understanding of conflicts in order to better creatively engage them. Edited by Professors Michal Alberstein and Jay Rothman and guided by an international advisory board of leading scholars and practitioners in the field, IJCER is an international, bi-annual, double-blind, peer-reviewed academic journal, published in both print and online format. It publishes cutting-edge original full text articles (4,500 to 8,000 words maximum) from well-established and new scholars and practitioners as well as advanced graduate students. The articles address conflicts, defined broadly to include: interpersonal, family, inter- and intra-organizational/business, as well as national and international conflicts. IJCER endorses all disciplines and methodologies, and conflicts from around the world, with the aim of contributing to the empirical, theoretical, prescriptive and practical understanding and creative engagement of conflict. Its particular hall-mark is in its disciplined effort to bridge gaps between theory and practice. IJCER invites submissions to its coming issues. To submit a manuscript, please see the Author Guidelines and then submit your manuscript via IJCER Editorial Manager. For inquiries, contact IJCER guest editor, Dr. Rafi Nets-Zehngut, at journal.ijcer@biu.ac.il.